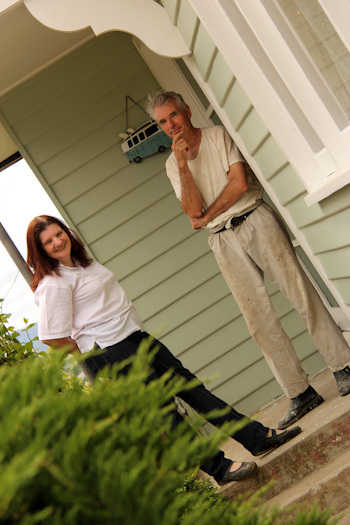 On the western hillside overlooking Launceston, there’s a little community of people who contribute freely to others’ lives by sharing the same space, same values and same heart. The houses and suburban blocks are much the same as those that surround Yvonne’s, but the house is full of people coming and going — students, friends, relatives … and us! 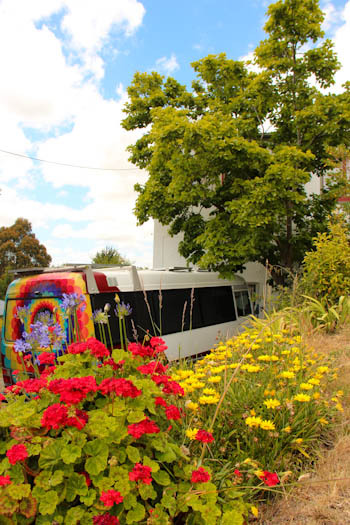 We're parked outside a friendly home in suburban Launceston, with the bus almost hidden by the glorious flower gardens! 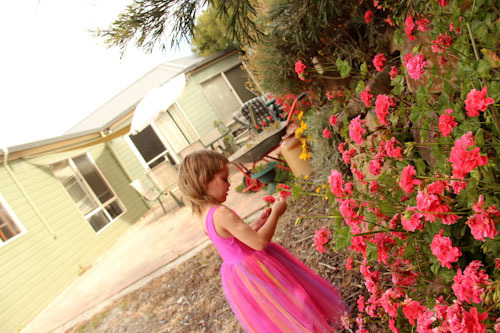 Our girls love collecting samples of all the colourful flowers that are currently in bloom. 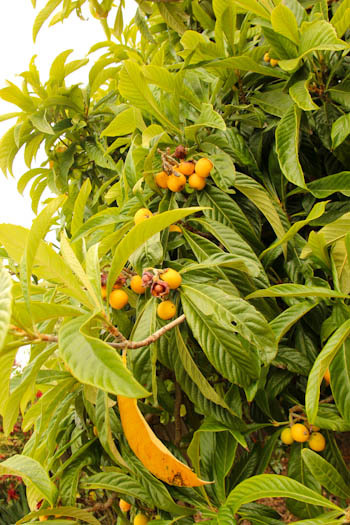 Among the fruit trees in Yvonne's garden, I find this loquat tree laden with fruit. I've seen many loquat trees, but have never tasted the fruit before. The loquats are ripe, slightly-sour stone fruit that taste like a cross between a lychee and plum. 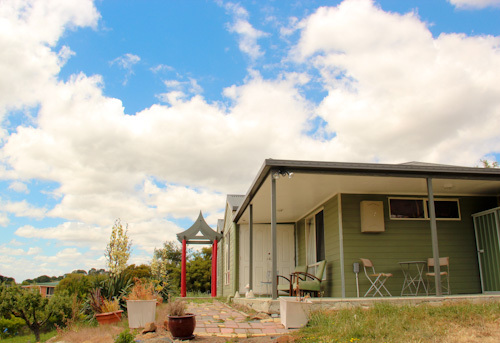 Yvonne's house is perched on the hillside overlooking Launceston. 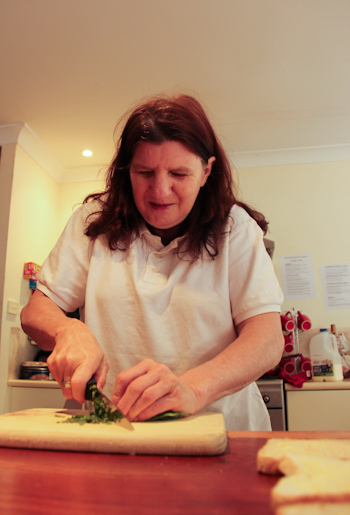 In between her current studies, Yvonne Gluyas works as caterer and, in doing so, has become involved by proxy with a variety of Launceston’s clubs and associations. 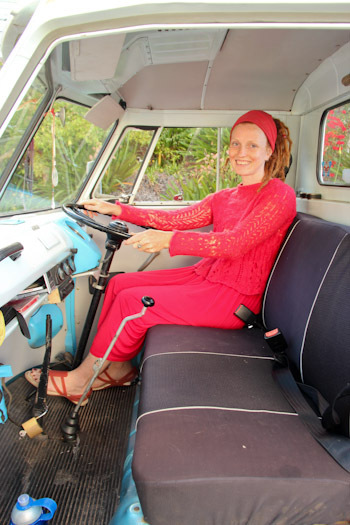 She’s no stranger to clubs herself and participates actively in the Women Writers Tasmania and the Launceston Toastmasters Club and has won accolades as a poet. However, it’s Yvonne’s personal invitations that set her apart. She invites people over, brings them home, hosts students for the university and offers her house to travellers passing through. Yvonne is busy in the kitchen when I come in for a chat. 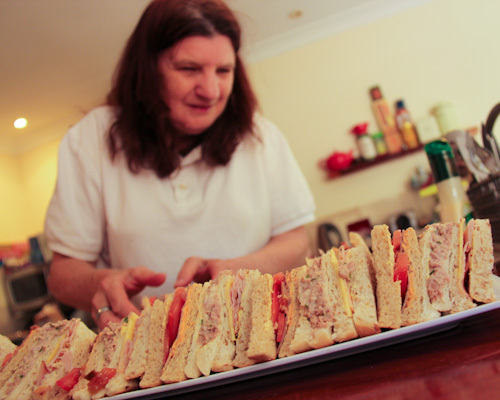 Yvonne runs a catering business from her home and today she's providing sandwiches for regular board meeting. Yvonne brought this magnificent bed back from China. 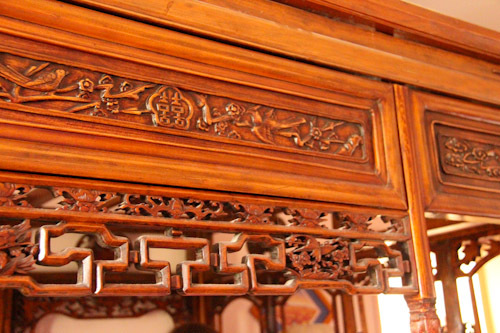 It's a traditional wedding bed — probably about 150 years old — and must have been hidden carefully so it wouldn't be destroyed in the Cultural Revolution. 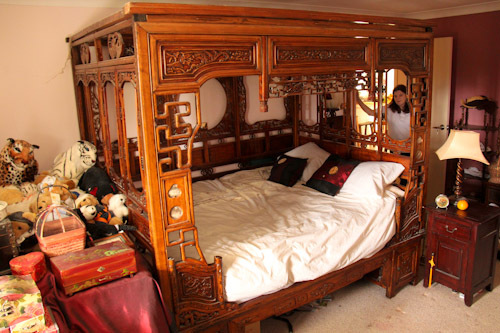 The bed is richly carved with Chinese characters and pictograms that promote happiness, prosperity and peace to those who sleep in it. 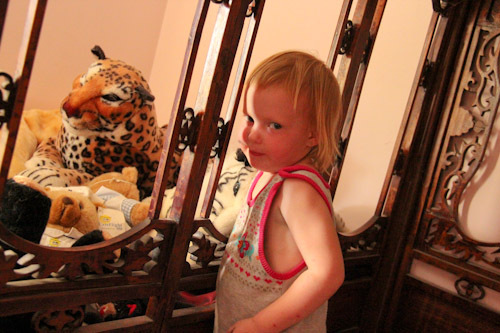 With the help of some fluffy friends, Delaney's imagination transforms the bed into a castle playground. Calista discovers a beautiful beaded necklace laying alongside the bed and adorns herself with it before she joins in the game. 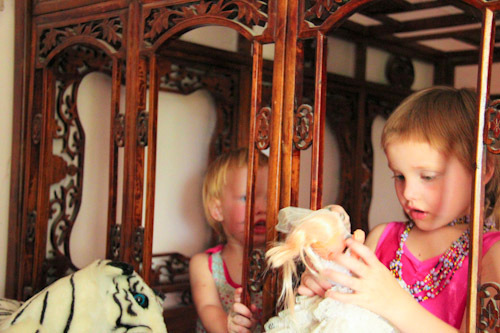 Yvonne's house is filled with souvenirs from her trips overseas. 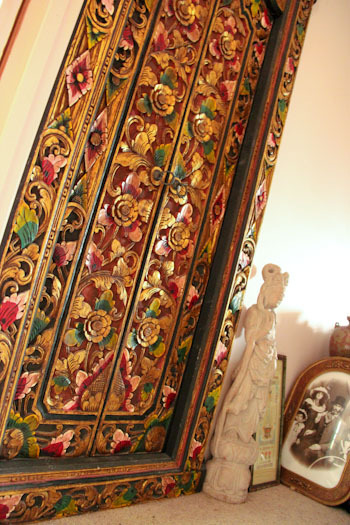 The door to her walk-in wardrobe is an intricately carved and painted piece from Indonesia. Yvonne’s brother is renovating a house next-door. Colin didn’t always live there, and he admits that Yvonne’s house would be too busy for him. However, by living and working on the block next door, he can join with people when he wants and retreat to his own space when it suits him. Yvonne and Colin are delightful neighbours, and I'm so grateful to have their company while we're visiting Launceston! 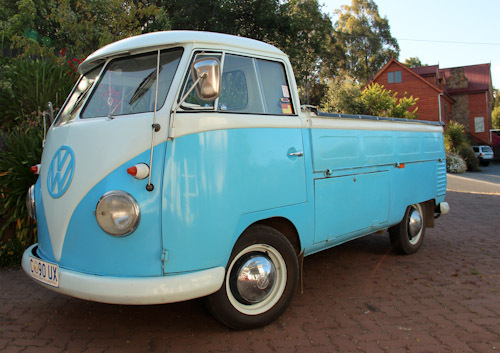 Colin's 1960 VW is probably the only split-screen ute in Tasmania. 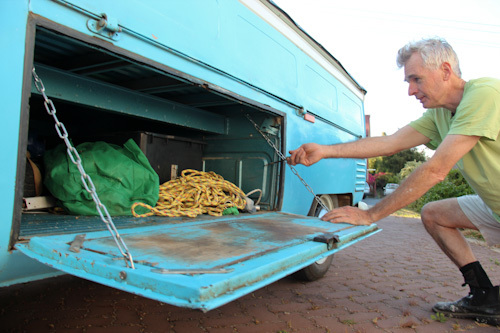 One of the only non-standard modifications Colin has made is to sensibly place the hinges on the treasure box's door on the bottom so that the door can serve as a bench seat. I'm just posing for the picture — I don't think Col would actually let me take his baby anywhere! 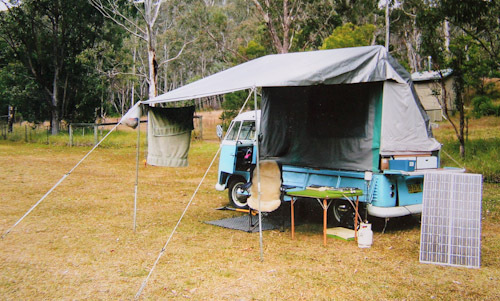 Colin has modified a tent to sit on the back of his ute and open into a neat mobile home solution! 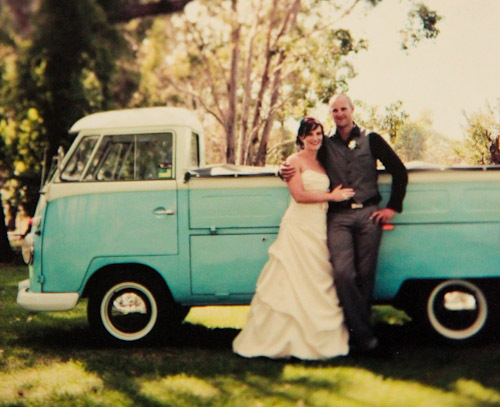 When he was living in NSW, Colin was flagged down by this woman who asked if she could use the ute as a prop in her wedding photos! 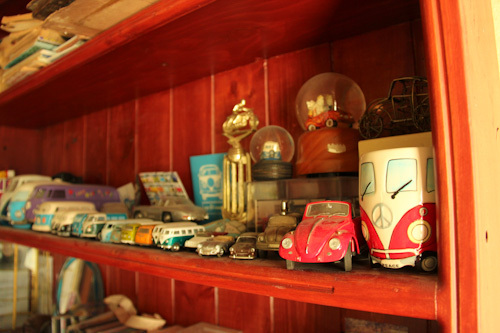 Col has a small collection of VW models. He says he doesn't really look for them — some just find him. I am fascinated how one vibrant woman can attract a community around herself. Instead of living and studying alone in her big house — (now that her children have grown up and left home) — Yvonne has positioned herself as the sun around which a number of small planets can orbit. And in creating a safe haven for locals, travellers and foreign students, Yvonne enriches her home-life with languages, cultures, food and sometimes heated discussions. I love seeing examples of real, relationship-based community within our modern society — whether it’s neighbours who have created a gate between their properties, families who participate in community events or people like Yvonne who open their home to whoever may want a cuppa or needs temporary accommodation. I’m inspired by Yvonne and hope that when I’m in a later phase of life, I will be contributing to a vibrant local community too. Hi Lauren and family!! Thank you for your beautiful photos and comments! Looking forward to seeing you again soon!